In the past year I will admit I have been a slacker. There really hasn’t been any major learning going on. Well not the new skills kind. Over this past year I have taken on a new mantra with my knitting and that is “It Will Fit”. This has meant lots of knitting and some pretty serious ripping too. I knit the Tea Leaves cardigan twice. The final incarnation is nice but there are still a few things that could be tweaked to make it a better sweater for me. The biggest thing I learned from the experience of knitting this sweater is that this style of sweater is not right for my body type. It draws attention to places that I don’t want attention. I also learned about how to measure myself for a sweater. 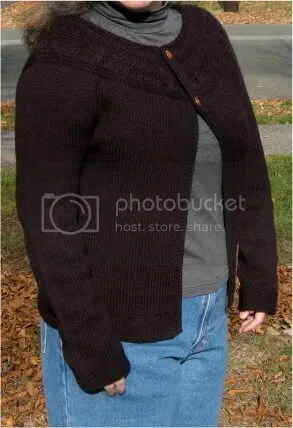 I have always knit the size sweater that matches the fullest point of my chest and this isn’t going to give me a sweater that I like the fit of. I do much better if I knit a sweater size that matches the measurement of my upper chest, above my bust. For me it happens to be about 2 inches smaller. Overall this gives a much better fitting body. 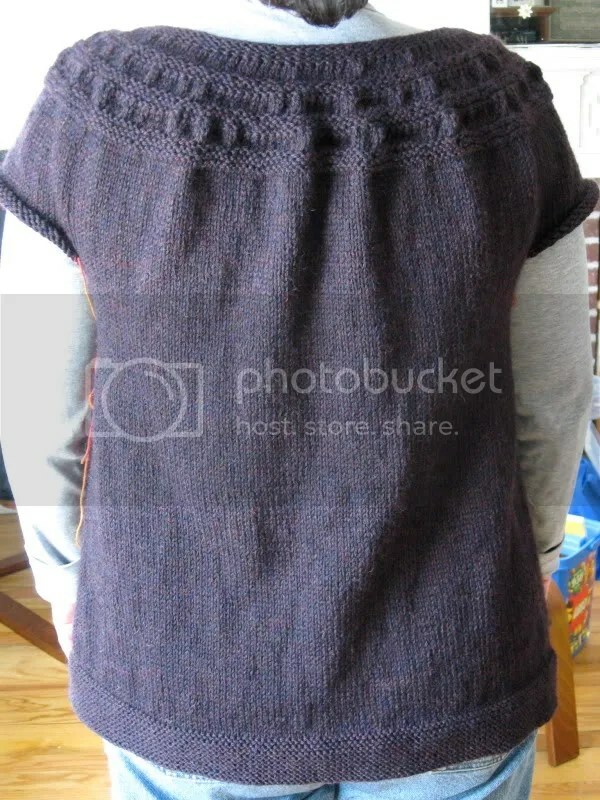 This is the first version of the Tea Leaves cardigan that I knit. It is sized for my fullest chest measurement. Notice how much too large it is across my back. The neck just about fell off my shoulders. It was at this point I just ripped it out and started over. I like to think that over this past year the things I’ve learned will help me to pick a pattern that will look good on me and not knit the entire body before discovering that it’s the wrong size. But I doubt it. My neighbor Liz is doing the 2nd Annual Knit and Crochet Blog Week too. Please visit her at the link in the side bar or by clicking her name in this post. Thanks! This entry was posted in 2KCBWDAY2. Bookmark the permalink. Fitting sweaters is not my strong point either. Maybe we are just too critical of our own work and what it looks like on us…I think yours look good on you! Seriously though, good food for thought! Hey, nice sweater. Getting sizes right is not so easy, so that is a good skill to have.